Singer/bandleader/cabaret artist Eddie Bruce will celebrate the music of the legendary Anthony Newley at the Rrazz Room in New Hope on Saturday, Feb. 9, at 8 p.m. The performance also features musical director and pianist Jeff Harris and bassist Boots Maelson. Eddie’s celebration of Anthony Newley pays tribute to one of most distinctive talents in show business. Newley was an actor, singer, composer and writer who had his first starring role in films at the age of 16, composed hit musicals and songs, topped the hit parade himself as a pop star, played everything from romantic leads to quirky character roles in movies, starred on both the West End and Broadway stages, and became a favorite of cabaret audiences from New York to Las Vegas. 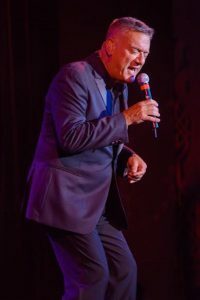 Eddie Bruce has performed tributes to Tony Bennett, Frank Sinatra, Newley and many others before sold-out houses at Feinstein’s, Resorts, Harrah’s and the Borgata in Atlantic City; the Ambler Act II Playhouse; Prince Musical Theater; Suzanne Roberts Theatre; Chris’ Jazz Café; and the Celebrity Room at Dino’s Backstage in Philadelphia, along with the the Philly Pops, Ocean City Pops, and the Hershey Symphony. His popular orchestra has performed at hundreds of charitable and corporate events, society galas and private affairs for decades. Most recently, Eddie Bruce starred in two sold-out stage shows at World Café Live and Drexel University’s Mandell Theatre with his delightfully swinging homage to the famed Latin Casino. The Rrazz Room is located at the Clarion Inn & Suites, 6426 Lower York Road, in New Hope. Advance tickets are available online or at (888) 596-1027.